Now another premier Sikh institution -- the 102-year-old Chief Khalsa Diwan (CKD), apolitical till recently, is embroiled in unsavoury controversies due to growing factionalism. The warring groups want to occupy the centre-stage by bending all rules. The CKD's leadership consisted of men of eminence like Bhai Sahib Dr Vir Singh, Sunder Singh Majithia, Harbans Singh Attari, Tarlochan Singh, Principal Bhai Jodh Singh, Dr Sohan Singh and Bhai Mohan Singh Vaid of Tarn Taran, who served the Sikh community to the best of their ability. 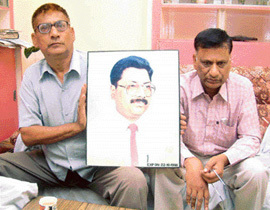 Even on the sixth death anniversary of Naresh Mahajan, a young bank manager of the Oriental Bank of Commerce, Putlighar Branch, who was murdered under mysterious circumstances on October 22, 1998, the progress in the case, has been tardy. The little hope that had flickered with the arrest of the accused after the investigation was handed over to the Central Bureau of Investigation (CBI), is once again being lost. Scholar-poet finds place in "International Who's Who - Poetry 2005"
Dr Karnail Singh is a man on whom erudition rests easily. He is the first Sikh and the second Indian to have toiled hard to earn the prestigious D.Litt in English language. It was by virtue of his political position that the degree of D.Litt was conferred on Giani Zail Singh, despite his being semi-literate. But Dr Karnail Singh, to use the cliché, has burnt the midnight oil to "earn" this degree. Environmentalists and heritage activists are up in arms against the Maharaja Ranjit Singh Panorama being constructed on war footing at the historical Ram Bagh gardens. The MRSP is alleged to be in gross violation of the directives of the Archeological Survey of India that had declared the entire garden as the "protected area". The aim is to impart self-defence skills to youngsters. And to give them a purpose in life. "Citizen Forum Vidya Mandir", a school for wards of drug addicts, is doing a yeoman's job in helping youngsters find meaning in their otherwise bleak existence. The Maharaja Ranjit Singh Panorama would be the second project of the National Council of Science Museums (NCSM), Kolkata, under the aegis of Ministry of Cultural Affairs. The Central Government has contributed Rs five crore, while the state has provided 4.5 acres of land for the project. Soon after the shradhs, the markets here are flooded with sales, discounts, packages and gifts for karva chauth that falls on October 31. Each segment is cashing in on festival that has become a rage, thanks to television serials showing elaborate celebrations. The declaration of the Archaeological Survey of India reads, "The heritage zone is an area of special historical and cultural interest, the character and appearance of which is necessary to be preserved. The Central Sikh Organisation of various Singh Sabhas was founded in 1902 with the mission of promoting the aspirations of the Sikhs and redressing their grievances, settling their religious differences and channelising Sikh public opinion. The preamble of the CKD, it is alleged, is being violated by using the hegemony of other Sikh institutions. In fact, rival factions claim that politics has completely overshadowed the century-old institution and its functioning has virtually come to a standstill. The CKD headed towards a split on November 12 last year when the ruling group, while invoking clause 12 of its constitution, terminated the membership of as many as 284 members (about 60 per cent of the total members ). This debarred the latter from casting their votes in the elections scheduled for January 2004. The split came to the fore when the CKD was celebrating the hundred years of its inception. The CKD was founded much before the formation of the Shiromani Akali Dal and the SGPC, which were formed in 1920 and 1925, respectively. It has an annual budget of about Rs 16 crore and runs hundreds of educational and social institutions, including the orphanage where Shaheed Udham Singh was brought up. However, the rival group described the move as "un-democratic", "unconstitutional" and decided to fight tooth and nail against this "injustice". The 284 persons who "ceased" to be members for allegedly not attending six meetings were from Punjab, Kanpur, Mumbai and New Delhi. They included many bigwigs, who had contributed a lot in their respective fields. However, Mr Bhag Singh Ankhi, the then-honorary secretary of the CKD, had claimed that most of the members who were debarred from voting in the forthcoming election had failed to deposit their "chanda" (monthly fee) on time. Clause 12 of the constitution of the CKD says that any member who fails to attend six successive meetings ceases to be a member. However, the rival group alleged that a large number of members was debarred from voting when the ruling group felt that it would lose the election. On December 24 last year, the Akal Takht directed the postponement of the controversial elections of the Chief Khalsa Diwan. Certain senior members have also levelled serious allegations of financial irregularities in the past. Interestingly, a former honorary secretary became a member of the Guru Nanak Dev University by depositing more than Rs one lakh from the CKD accounts in violation of the bylaws. The wrangling invited the local administration to intervene in the internal affairs of the Sikhs, obviously at behest of the state government. On December 3, 2003, the then-SDM , Mr Bhupinder Singh, locked the offices of Chief Khalsa Diwan. This was the most worrisome development for the community. On the pretext of holding smooth election, the SDM was appointed as the administrator by the district magistrate, though there is no such provision in the constitution of the CKD. The SDM would remain in control of the affairs for two months so that the election of the CKD were held smoothly. Mr Bhag Singh Ankhi, the then-honorary secretary of the CKD, termed the move of the district administration as "state terrorism", which amounted to "direct interference" in the affairs of the Sikhs. Without locus standi, the National Commission for Minorities (NCM) stepped in on December 5. This surprised everybody as the NCM had intervened in the state where the Sikhs are in majority. The NCM directed the Deputy Commissioner , Mr Raminder Singh, to send a detailed report within 48 hours as to how the district administration had taken over the charge of the Chief Khalsa Diwan - the oldest Sikh institution, though there is no such provision in its constitution. Unmindful of his own ultra-constitutional interference, Mr Tarlochan Singh, Chairman of the NMC, said that the act on the part of the deputy commissioner was ultra-constitutional. The deputy commissioner, however, pleaded that he had issued speaking orders under Section 144, as there was an apprehension about breach of peace due to extreme postures taken by the two warring groups of the CKD in the wake of the forthcoming elections. The credibility of the Akal Takht is again at stake, as the Sikh high priests have failed to break the impasse by brokering permanent peace even after a lapse of one year. Jathedar Vedanti directed both warring groups to desist from dragging the fair name of Chief Khalsa Diwan in courts by filing petitions against each other. His directions that nobody should issue any statement to the press fell on deaf ears. The warring groups also put Jathedar Akal Takht, Giani Joginder Singh Vedanti, in a fix as their counsels had dragged the highest temporal seat of the Sikhs in the court. While one group had submitted at least four directives in the court, the rival group had stated in the court that the Akal Takht was in no way involved in the process of elections as the CKD was being run independently according to its own constitution. Earlier, both groups had given their solemn undertakings to Jathedar Vedanti that they were fully dedicated to the Akal Takht and any directive given by him would be binding on them. Though the Jathedar of the Akal Takht had directed the warring groups to desist from approaching the court, yet the battle for acquiring the control of the CKD is also being fought in the district court here. Earlier, Justice Kuldip Singh (retd) had also remarked that such an effort on the part of the Sikh clergy could lead to legal complications. He said that the Chief Khalsa Diwan was a registered body and any of the members could approach the court against the intervention of the Takht. 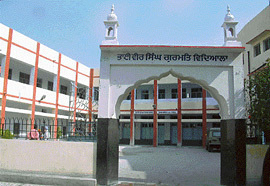 The Akal Takht had to dissolve its own five-member committee and constitute another committee of 21 members on April 20 to resolve the vexed crisis of the CKD. The mediation efforts by the Akal Takht to resolve the crisis in the CKD suffered yet another setback when some senior members wrote to the Prime Minister seeking his intervention for conducting free and fair poll at the earliest. Some of the members, in a written letter to the convener of the CKD appointed by the Akal Takht, have raised serious objections over the "backdoor" entry of Mr Manjit Singh Calcutta, honorary secretary, SGPC and Mr Tarlochan Singh, chairman, National Commission For Minorities, in the four-member "advisory panel". However, Principal Jagdish Singh (Convener) said that they (Mr Calcutta and Mr Tarlochan Singh ) were only invited to facilitate the functioning of the CKD. The election of the office bearers of the Chief Khalsa Diwan were announced in June last year and were due in November 2003. The letter alleged that the "outgoing regime" aided and abetted by Mr Tarlochan Singh and Mr Calcutta managed to scuttle the elections. Notable achievements of the Chief Khalsa Diwan leaders in pursuit of the goal of restoring Sikhism to its "pristine purity" was to get rid of some of the harmful and orthodox customs .The Anand Kaaraj Act, passed in 1905, giving legal sanction to the marriage ceremony performed according to the Sikh rites, was another achievement. This brought revolutionary awakening among the Sikhs which ultimately led to the 'Gurdwara reforms Movement' against professional priests. The role of the Chief Khalsa Diwan was pivotal in giving a distinct identity to the Sikh community. As a result of its sustained efforts, the Sikhs were able to get their distinct symbol, language and public holidays, separate place of worship and constitutional recognition as a distinct group at the time when the majority of the Sikhs themselves were not clear whether or not to regard their religion distinct from Hinduism. A house for aged and poor has been established at Tarn Taran. It is managed by the local committee of the Chief Khalsa Diwan, Tarn Taran, Amritsar district. This Birdh Ghar was named after Sikh community's most famed and revered poet of Punjab — Bhai Vir Singh. The Sikh Educational Committee, established in 1908, started its work in the right direction, and up to 1920 it was running 200 educational institutions, both for boys and girls. Students were taught to follow the teachings of the Sikh Gurus, which included universal brotherhood and equality of all, irrespective of caste, colour and creed to which they belonged. Mr Banarsi Das, father of the victim, died waiting for justice. The investigation changed many hands. Even the premier investigation agency, the CBI, which was entrusted with the case in 2001 on the directions of the Punjab and Haryana High Court, has failed to yield any results. Investigating officers visit the city and return without arriving at any conclusion. Mr Satish C. Mahajan, brother of the deceased, alleged, "Even the directions of the Punjab and Haryana High Court have proved ineffective and the CBI has miserably failed to bring the accused to the book." He said the High Court had at the time of handing over the enquiry to the CBI clearly instructed that the investigation be carried out by an officer of the SP rank. However, he alleged, every time a junior official came to investigate the case and that nothing concrete had been done so far. This murder was one of the most sensational cases. The deceased's body was found in his car abandoned in Ranjit Avenue area. The police had registered a murder case under Sections 302, 201, 148, 149, 34 and 120B of the IPC. The police immediately sprung into action on hearing the news of the murder and the then-SP City was directed to investigate the case. He initially reported it to be a case of suicide. However, the family had suspected it to be a case of murder. Investigations by the police revealed it to be related to parallel banking operation. It was found that certain persons working in close liaison with the deceased for running this operation could have been involved in eliminating him to destroy the evidence of their dealings. The family had also named some persons, including the deceased's bank colleagues, as suspects. As many as 10 investigating officers from Punjab police and four CBI officers, who were handling the case, have been transferred on one or the other pretext. The suspects roam scot-free allegedly due to money power and political connections. According to the deceased's brother, they suspected the involvement of three of his brother's colleagues and two prominent industrialists. He alleged that the police was shielding them. He said the then-SP and one of the investigating officers in the case, had got arrest warrants issued against the five suspects, including two prominent industrialists Onkar Nath Sharma alias Master Omi and Inderjit Sharma. However, the then-SP was promoted and transferred in the middle of the investigation. He had indicated in his investigations that the murder was related to the parallel banking racket. The family members have also written to the President, Mr A.P.J. Abdul Kalam, and other prominent leaders. Earlier, the family had written to the National Human Rights Commission (NHRC) and the Punjab Human Rights Commission (PHRC). Disappointed with the inaction of the police, the Mahajan family knocked the doors of the Punjab and Haryana High Court in 1999. This scholar, who retired as Professor of English from Khalsa College, Amritsar, has now achieved another distinction by securing his name in "International Who's Who — Poetry 2005". He has created a niche for himself in English poetry. His crisp and meaningful poems showcase his skills as a poet. He was born in small border village, Heir, on Rajasansi Road here. He drew emotional sustenance from the bounty of nature, he says. As destiny would have it, circumstances forced him to move to Lucknow when he was only six years old. With the inspiration and support of some intellectuals, he set on his academic journey at Lucknow University. Earlier, he had been denied admission by British teachers on the pretext that his pronunciation was not up to the mark. This did not dampen his spirit and he worked hard, and within a few years his accent matched that of Englishmen. After completing the master's in English language, he did his PhD on "T.S. Eliot as critic" — a subject that was a challenge for a person with a rural background. He was awarded D.Litt on the topic "Literary criticism of F.R. Leavis". After getting higher education from the prestigious educational institutes, he preferred to return to his hometown Amritsar, where he joined Khalsa College in early sixties. Later he became head of the English department there and worked in this capacity till his superannuation. In his works — "The Open Heart" (1993), "The Wounded Muse" (1994) and "Mysteries of Love" (1996), the semiotic and semantic aspects are coalesced in such a manner that reader can enjoy it on the literal and the symbolic levels. Environmentalists and heritage activists are up in arms against the Maharaja Ranjit Singh Panorama (MRSP) being constructed on war footing at the historical Ram Bagh gardens. The MRSP is alleged to be in gross violation of the directives of the Archeological Survey of India (ASI) that had declared the entire garden as the "protected area". The panorama was approved to coincide with the bicentenary celebrations of the coronation of Maharaja Ranjit Singh, who had built the garden as a summer palace based on the design of the famous Nishad Bagh. The activists and the environmentalists are peeved over the panorama being raised near the protected Ram Bagh Deori. Mr Charanjit Singh Gumtala, former President, Amritsar Vikas Manch, said that as per the Ancient Monuments, Archeological Sites and Remains Act, 1958, "No construction is allowed within radius of 100 mt from the protected sites, while construction within the zone of 200 mt is to be regulated". Mr Gumtala alleged that there was another violation in form of "de-notifying" the protected gardens. About 20 kanals of the "protected area" as per the state government's notification was rendered "unprotected". Earlier, under the Punjab Ancient and Historical Monument and Archeological Sites Act, 1964 (Section IV, Sub-Section III), entire Ram Bagh was declared a "protected area" in the year 1997. Environmentalists feel that instead of maintaining the garden as a park, it is rapidly being converted into a concrete jungle. Besides, four parks around the walled city are in pathetic condition, they add. The aim is to impart self-defence skills to youngsters. And to give them a purpose in life. "Citizen Forum Vidya Mandir", a school for wards of drug addicts, is doing a yeoman's job in helping youngsters find meaning in their otherwise bleak existence. In just five years of its existence, it has brought a new hope to children of drug addicts. Located at Maqboolpura, an area tragically referred to as "the locality of widows", the school is imparting training to as many as 50 students. Fatherless Aman Kaur, a student of VI class, learnt the basics of judo within a short span of two months. Unmindful of resource crunch, she aims to test her mettle in the coming district championship. Aman's father, a drug addict, died some six years ago leaving behind four children and wife to fend for themselves. In an environment, where parents, siblings and other relatives, are in the grip of the menace of drugs, the exposure to sports has changed the lot of these children. For Baby, a student of III class, life, has been an unending saga of pain. She has seen three deaths in her family. Her father is a drug addict. She, however, asserts with a conviction much beyond her age, "I am very happy to have learnt judo. I have no time now to think about sorrowful things." Rajwinder Singh, whose father is a drug addict, has also found solace in judo. His elder brother was recently apprehended under the Narcotics Act. " Drugs would never find a place in my life. Now, apart from studies, I have judo to look forward to," he says. Mr Brij Bedi, a social activist, is the man behind the school. Mr Ajit Singh, a teacher and resident of the same locality, is assisting him. The school, with the strength of 380 students, has the aim of helping youngsters from families affected by drug addiction grow into emotionally mature and psychologically developed individuals. "Judo was introduced to help these youngsters focus their energies on something constructive," says Ms Parveen Kaur, Principal of the school. An international judo player Sandeep Kaur has been roped in to teach the game to the students. The budding judokas have a coach who stood fourth in the Asian Judo Championship, 2000, held at Hong Kong and bagged the silver medal in the Asian Club Judo Tournament, 2000. The coach says that the students assemble at Madan Lal Dhingra Park every morning to learn the nitty-gritty of the sport. 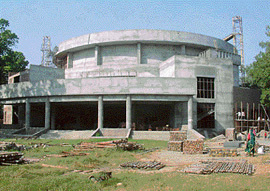 The NCSM built first panorama (depicting the epic Mahabharata) at Kurukshetra, apart from running 30 science centres in the country. Mr D. Pal, Technical Officer of the Project, said, "Unlike the Kurukshetra Panorama, this panorama would not have the science centre. The state government would maintain it, after the construction is complete." Earlier, former Prime Minister, Mr Atal Behari Vajpayee, had laid the foundation stone of this panorama on November 18, 2001 at "New Amritsar" to mark the bicentenary of the coronation of Maharaja Ranjit Singh. Three acres of land were earmarked by the improvement trust, but the proposed site was shifted to the "protected area". This raised many eyebrows. As of now, the proposed panorama is spread over 20 kanals in the "protected area". Mr Pal said the paintings were being prepared at the NCSM, Kolkata. Statues in the foreground would transport onlookers to the "theatre of war". A portion of the panorama would depict "darbar" (court) scenes. Historians were being consulted on it. Visitors would be allowed only in the central part of the building from where they could get a feel of the spectacular scenes depicting the Maharaja's reign. This centre will be located on the second floor, he added. The project that started in July last is expected to be completed by March next year. Soon after the shradhs, the markets here are flooded with sales, discounts, packages and gifts for karva chauth that falls on October 31. Each segment is cashing in on festival that has become a rage, thanks to television serials showing elaborate celebrations. Readymade thalis, coloured bangles in various materials ranging from glass to steel to “lak” and bangles studded with sarvoski crystals, glass beads and glitter are hot this season. Bindis, which once used to be merely big or small dots in colours have been replaced by elaborate designer bindis of crystals, velvet, kundan. Some of these bindis are sold at Rs 100 per piece! Interestingly, the popular vamps in TV serials like “Kamolika'” (Kasauti zindagi ki) and “Ramola” have stolen a march over heroines as role models for bindi designs. Besides this, discounts in cosmetics and incentives like buy-one-get-one-free are also being offered. New designer hair adornments, clips, bands have arrived! Elaborate “sargi” and “pooja” thalis are high in the list of purchases. Even beauty parlours have jumped into the fray by offering attractive discounts, packages promising to make women “glow” on the special day. Gold, silver, pearl facials are some of the most expensive facials being promoted these days. Sales of saris, suits, jewellery, too, have shot up. The trend of pooled-in parties is catching on. These parties offer interesting games, quizzes and gifts. The declaration of the Archaeological Survey of India reads, "The heritage zone is an area of special historical and cultural interest, the character and appearance of which is necessary to be preserved. The heritage zone is under threat from many things, including construction of modern buildings. In most of the cases, town and country planners ignore cultural significance of historical areas while preparing developmental plans. Insertion of modern buildings not befitting the overall architectural style further damages the character of historical areas".